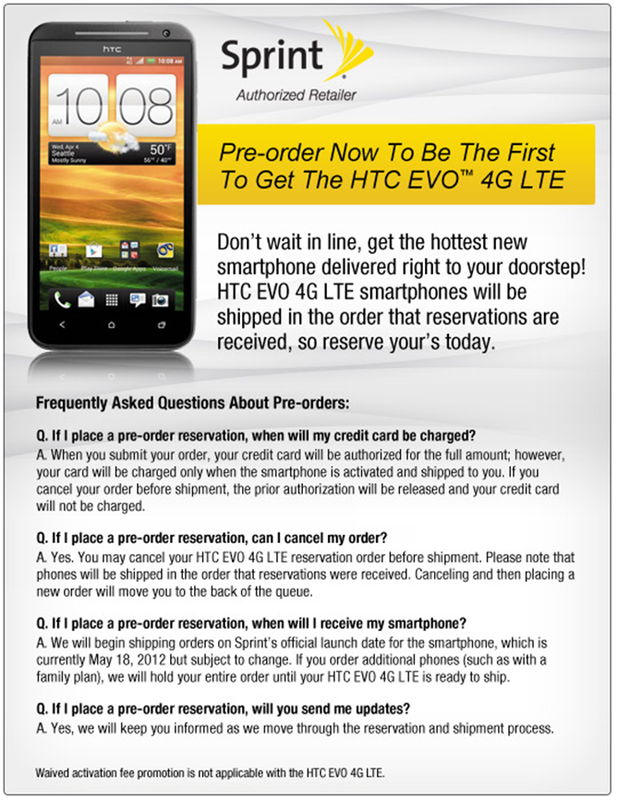 Want to hear more about the EVO 4G LTE? Good! Because we have a release date for you! And if you don't like that one, we have another one. According to Wirefly's pre-order FAQ page, this slick beast will be unleashed on May 18th. Sprint's own pre-order confirmations seem to lend some credence to this idea, stating that pre-order will begin to ship as early as May 15th. 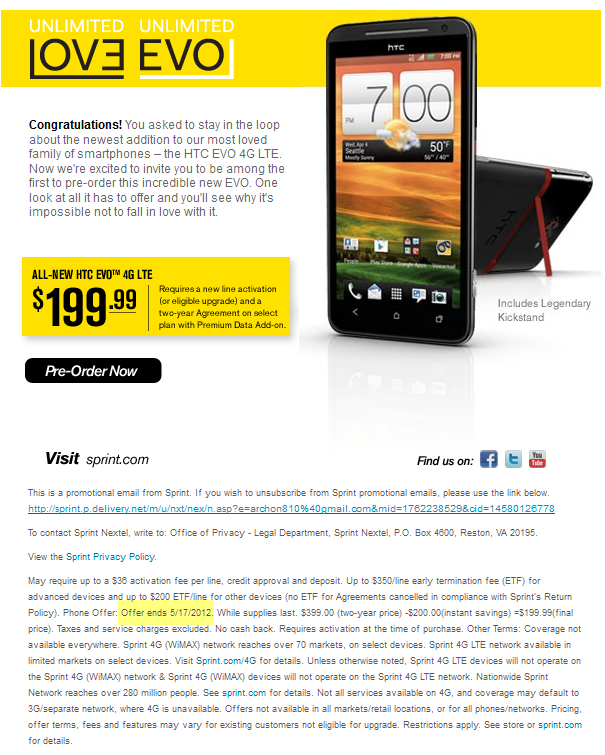 Sprint's promotional email also supports this, stating that the pre-order offer ends May 17th, which would make sense if the next day is launch day. 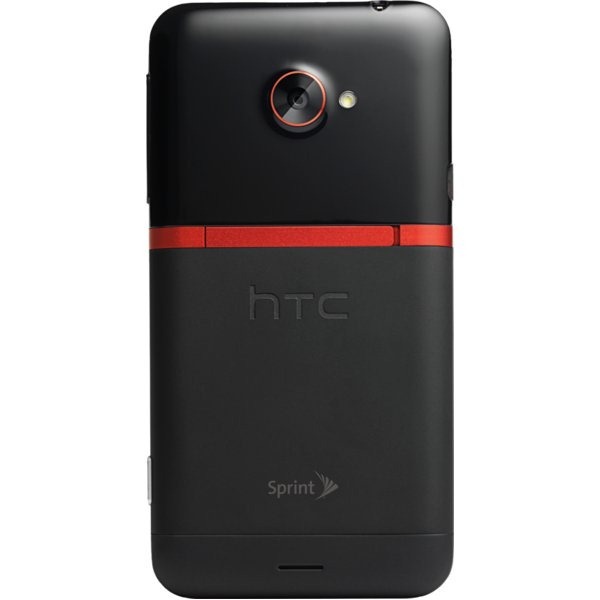 "In fact, the EVO LTE is currently finishing up its stay in the Sprint Lenexa labs and was scheduled to complete lab testing on April 27th. However, there are problems with the device that are occurring. It is being reported to S4GRU that "LTE device connectivity in lab testing continues to be problematic due to under defined processes and complications around provisioning and SIM UICC profiles. Escalation of this issue is in progress."" S4GRU believes that the device was always scheduled for a June 10th release date, and that these hiccups are still right on schedule. We have little to go on but the site's word, which hasn't proven to be unreliable in the past, but conflicting evidence from trusted sources does make things a little foggy. S4GRU also said, in a comment, that they believe Sprint pulled the trigger knowing that there were LTE connectivity issues, but that the carrier would fix them via an OTA update later on, just prior to activating its LTE network. We'll see what happens. It won't be too much longer to wait before we find out whether or not the May 18th date is legitimate. Until then, speculate away!